This past weekend I was at the 46th running of the 24 Hours of Daytona. Great race as usual and its the kickoff to the 2008 racing season. Now, I'm in race mode much to the Chagrin of the wife. I was digging through some old photos and stumbled on this beauty. This is from the 1979 12 Hours of Sebring and shows the second place overall car of Brian Redman, Paul Miller, and Charles Mendez. The car has just come off of turn 17 and is on the front straight. Redman was attempting a repeat victory in a Porsche 935 and some slight mechanical problems allowed Bob Akin to take the 1979 victory. Porsche has long been a dominate marquee in auto racing, and is still the most winning manufacturer at Sebring with 17 overall victories. 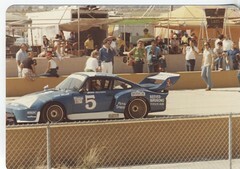 The 935 was a dominate model in the late 70's and early 80's during the great IMSA days. This photo is a great example of the aerodynamic body work they were experimenting with. If anyone has stories on this please comment. I will be posting more vintage photos as I get them scanned.